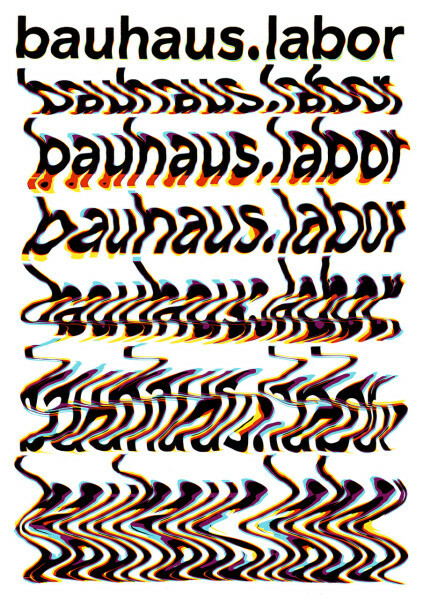 In the winter semester 2018/19, with the subject of ›bauhaus.lab‹, the master programme ›Gutenberg-Intermedia‹ starts a three-semester discourse on Bauhaus typography and media installations today: the year 2019 will be the 100th anniversary of Bauhaus – lessons at the internationally influential school started in 1919. We take this as an occasion to formulate forward-looking creative positions in a critical confrontation with typographic and medial visions of the past. Bauhaus. They provide the projection screen for your very own personal typographic experiments, media installations and participative projects in the bauhaus.lab, in which the fascinating variety of typographic and digital design shall be expressed. Free and playful design experiments up to complex exhibits, that shall be realised and presented in 2019 within the framework of the ›National Bauhaus Year‹, are possible. In the bauhaus.lab you will not only have the various analogue workshops (for example letterpress and gravure printing, silkscreen, bookbinding, photography) but also the digital labs (inter alia interaction and electronic engineering workshop, tracking laboratory) at our university at your disposal to get closer creatively to what will make up typography and digital design in the future. Check out our Instagram @bauhaus.labor to see some impressions. In addition to a joint project in the first semester numerous excursions, lectures, workshops on type design and programmed design will be offered. From the second semester on you will work on your own Master’s project. We invite communication designers with a preference for digital media as well as media designers and media computer scientists interested in deeper insights into the world of typography and digital design to apply for entry.